I've received a lot of message lately, some from my friends and some from my readers. 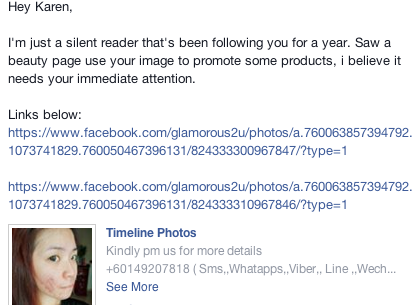 Telling me that there are someone misuse my photo for their products. 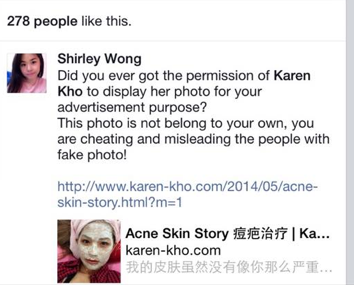 This is not the first time i saw people stealing my acne photo without permission for their "products" testimony. Last time is another online shop. In facts, I NEVER USE ANY OF THOSE PRODUCTS! I don't know where are these "skin care" comes from. I don't even know is that a certified skin care. Therefore i'm here to make a short clarification before anyone got cheated or mislead. Some of my friends help me to comment on that photo and ask them to take down the photo, but the owner deleted their comments and blocked them from commenting. BUT FOR THIS, I never ever TRIED or USE it before! This irresponsible ONLINE SELLER is stealing my photo for their products. common sense, if the products is really good. 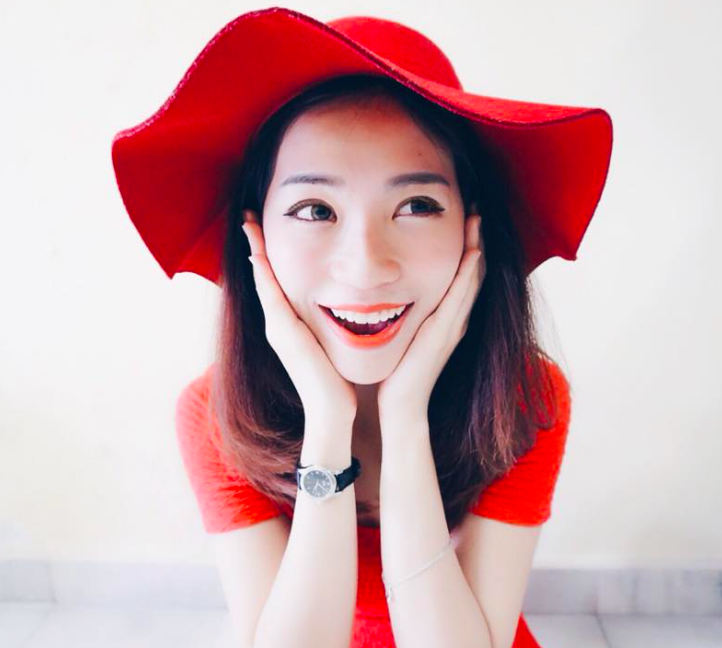 Do that need to steal people's photo and FAKE a testimonial? OF COURSE NOT! Therefore, please don't trust any testimonial blindly from online seller. Especially SKIN CARE (something that you need to APPLY on your FACE) !! Please beware of people like this. Hopefully there's no 无知妇儒 that got cheated. 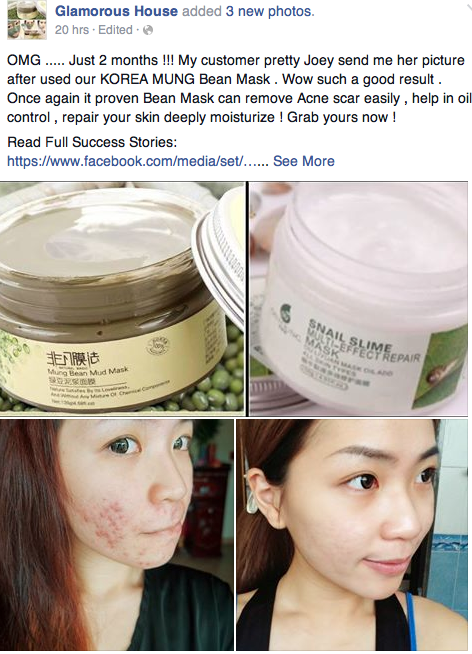 Even till now, i still receive a lot of email asking me how do i recover from ACNE. I will be updating my current skin anytime soon. You can also ask me any question regarding breakout by dropping a comment down below. I will try my best to share my experience out in my next posting to all the people out there who suffered with bad acne. Please help me to report the page and share this out before anyone got cheated.